Dr. Warren Steel leading at the first National Convention. 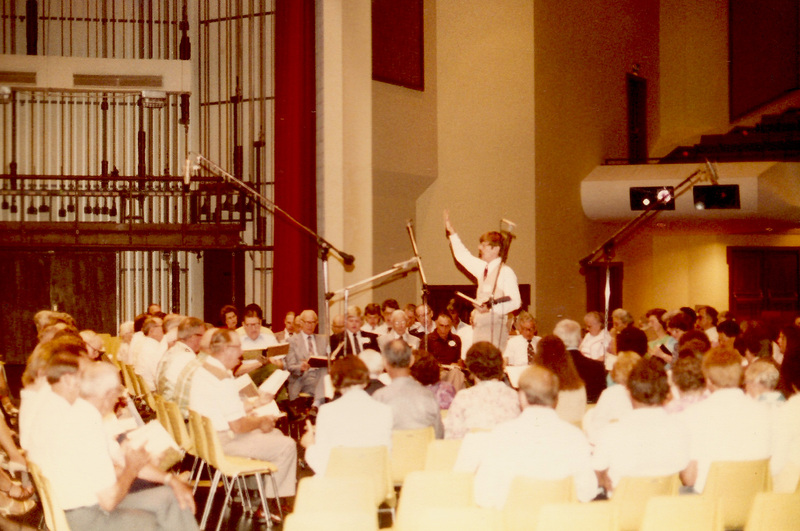 In June of 1980, singers from around the nation took part in a new, four-day Sacred Harp convention in Birmingham. 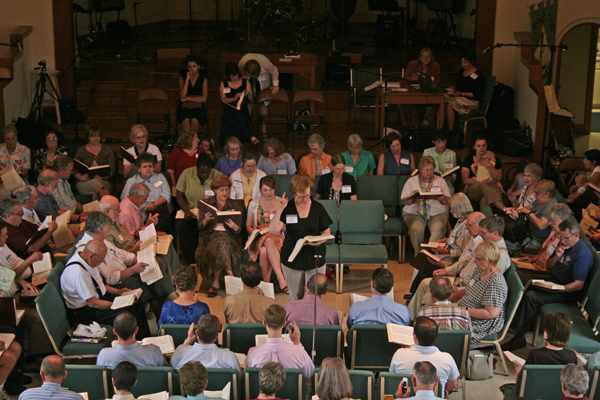 This was no ordinary singing—in a unique series of events, participants honored the heritage of Sacred Harp tradition while celebrating the growth of new singing communities far from the music’s Southern homeland. 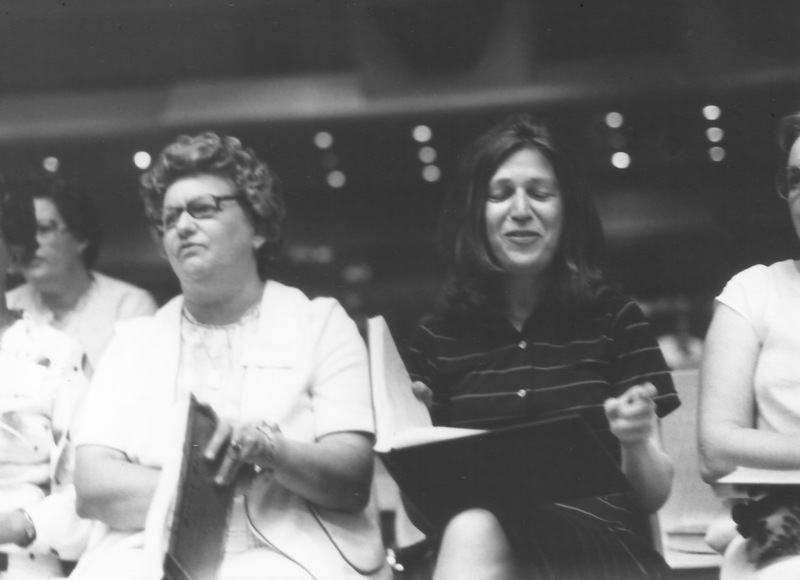 This online exhibition brings together documents, images, and recordings from the collection of the Sacred Harp Publishing Company that tell the story of the first National Sacred Harp Singing Convention. 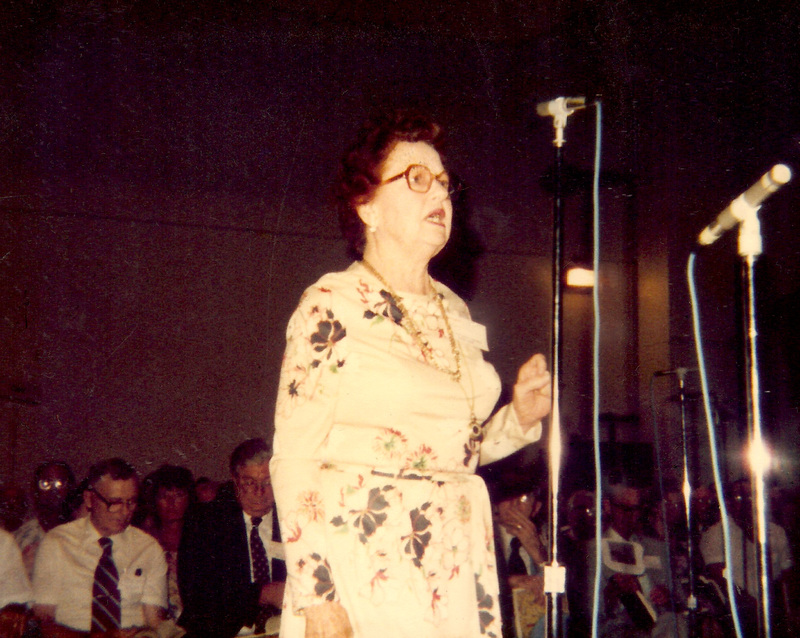 Several singers shared their photos of early National Conventions with the Sacred Harp Museum. Visit the photo album to see photos of the first several years of the National Convention from the museum’s collection. 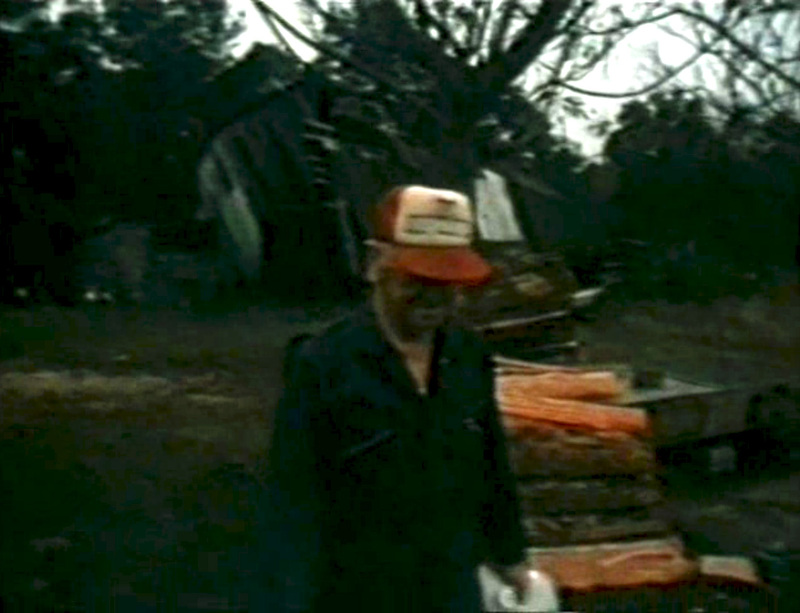 The Sacred Harp Publishing Company produced a set of eight cassette tapes of the first National Convention. Visit the recordings page to listen to the entire convention. Minutes for the first National Sacred Harp Convention. Recognizing the fist National Convention as a momentous occasion, rather than publishing the minutes in that year’s minutes book, its organizers published a separate set of minutes and directory of participants. The eighty-four-page booklet records the entire order of events, lists each leader and their song selections, and includes a “pictorial remembrance” with photographs of the convention. The first National Convention minutes book, text-searchable version (25.4 MB PDF). The first National Convention minutes book, regular version (4 MB PDF). A signed copy of the program for the Thursday, June 26, session of first National Convention, given to singers as they arrived. Claude Rhea and the Samford University Music Department were exceptionally generous in facilitating the printing of this brochure, which explains the uncharacteristic use of the word “Sing” to describe a Sacred Harp convention. In fact, the tradition that limited leading to men had evaporated by the mid-twentieth century, and by 1980, many of the most respected and admired leaders were women. “Ladies’ Day” at the first National Convention was truly memorable. Celebrated leaders including Marie Creel Aldridge, Mary Kitchens Gardner, Joyce Walton, and many others took the floor, while an all-women slate of officers presided. Fittingly, the president for Ladies’ Day was Ruth Brown, who would become one of the most important ambassadors for traditional Sacred Harp. The bus trips she organized throughout the 1980s and 1990s were instrumental in bringing together singers from all different communities, very much in the spirit of the National Convention. The Sacred Harp Museum holds a variety of materials that document the original National Convention. 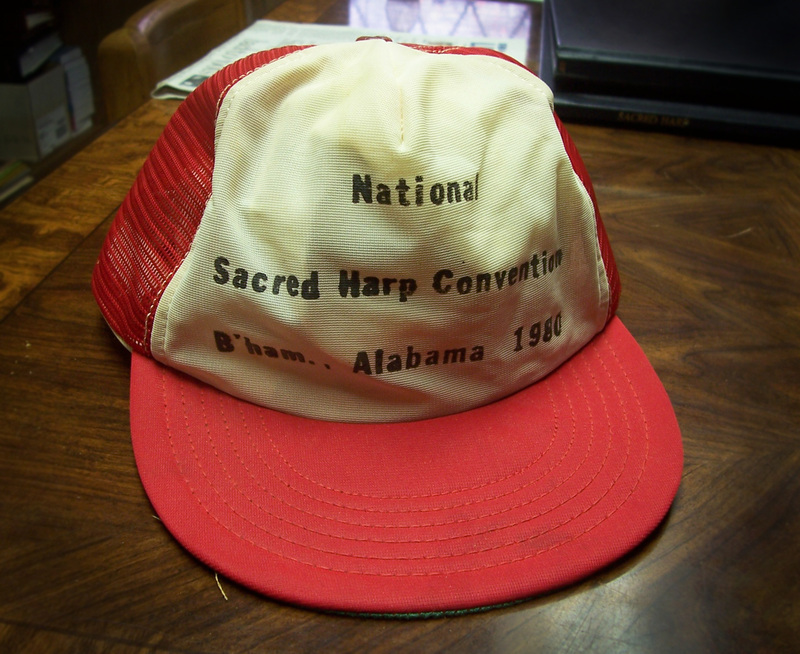 Among the most charming is the promotional cap made for attendees—true Sacred Harp aficionados will recognize it as the hat worn by Leonard Lacy while doing chores on the 1984 film, The Sacred Harp Singers. Looking down on the class at the 2007 National Convention. Photograph by Jonathon Smith. The National Sacred Harp Singing Convention continues to attract singers from around the nation and across the world. Make plans to attend on the the Thursday, Friday, and Saturday before the third Sunday of June each year. The National Convention is scheduled for June 12–14, 2014 at First Christian Church, 4954 Valleydale Road, Birmingham, Alabama. For more information, see the convention’s website. We invite you to share your experiences. Leave a comment in the box below with your recollections, stories, or observations of the National Convention over the years.